Messe Frankfurt organized a special exhibition in cooperation with ESA and the German Aerospace Centre that illustrated a wide variety of applications for technical textiles in relation to space travel. The recent collocated Techtextil and Texprocess shows held in Frankfurt showed growth in both exhibitor and visitor numbers. The collocated Techtextil 2017 and Texprocess 2017 shows recently took place in Frankfurt under the theme “Living In Space.” Organizer Frankfurt-based Messe Frankfurt reported the largest number of exhibitors for the event to date with 1,789 total exhibitors at both shows, which represented an increase of 7 percent over the 2015 edition. In 2017, 1,477 exhibitors from 55 countries participated in Techtextil; and 312 exhibitors from 36 countries presented at Texprocess. 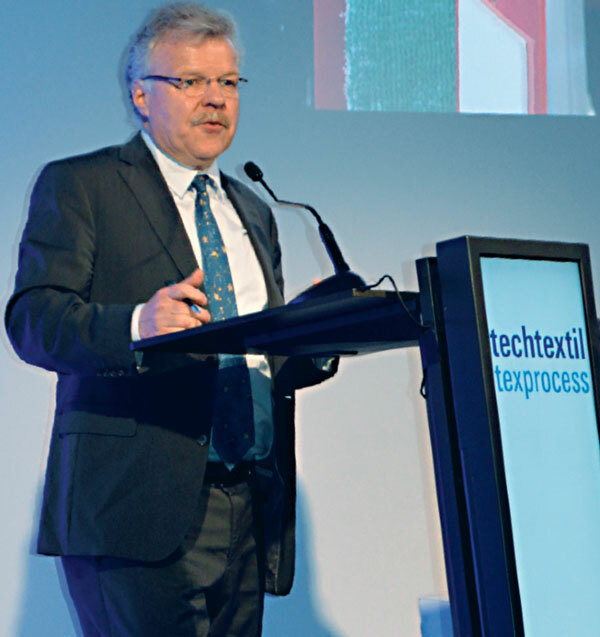 Techtextil also continues to increase in internationality. Some 71 percent of exhibitors — a total of 1,054 — came from outside of Germany in 2017. The five largest exhibitor nations were Italy, China, France, Switzerland and the United Kingdom. Three new nations — Lebanon, Mexico and Vietnam — each were represented at the show for the first time with one exhibitor from each country participating. The largest exhibitor nations at Texprocess were Italy, China, Turkey, Taiwan and Poland. Messe Frankfurt reports approximately 33,670 visitors from 104 countries attended Techtextil, up from 28,491 visitors in 2015. More than 7,091 visitors registered for the concurrent Texprocess show and both shows benefitted from the synergy of visitors. The continued growth and success of Techtextil is supported by figures that illustrate the growth of the global technical textiles industry. Figures compiled by Commerzbank and shared in its “Technische Textilien” study published in 2015, predict the market for technical textiles will grow to $160 billion by 2018. This figure does not include composites or nonwovens. The same report estimates the worldwide share of technical textiles production is 27 percent of overall textile production. Messe Frankfurt reports turnover for Germany-based manufacturers of technical textiles is approximately 13 billion euros per year. 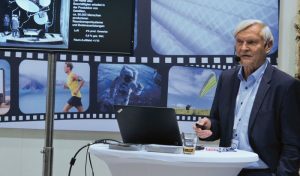 Former European Space Agency astronauts Dr. Ernst Messerschmid (below) and Dr. Reinhold Ewald (above), spoke at Techtextil about the applications for technical textiles in space exploration. To complement the “Living in Space” theme, Messe Frankfurt organized a special exhibition in cooperation with ESA and the German Aerospace Centre. The exhibit illustrated a wide variety of applications for technical textiles in relation to space travel and exploration including several space suits and a Meteron Eurobot rover. A Material Gallery highlighted textiles and technologies from exhibitors that were related to space travel. Visitors also could experience a journey through space to Mars in a virtual reality interactive area. 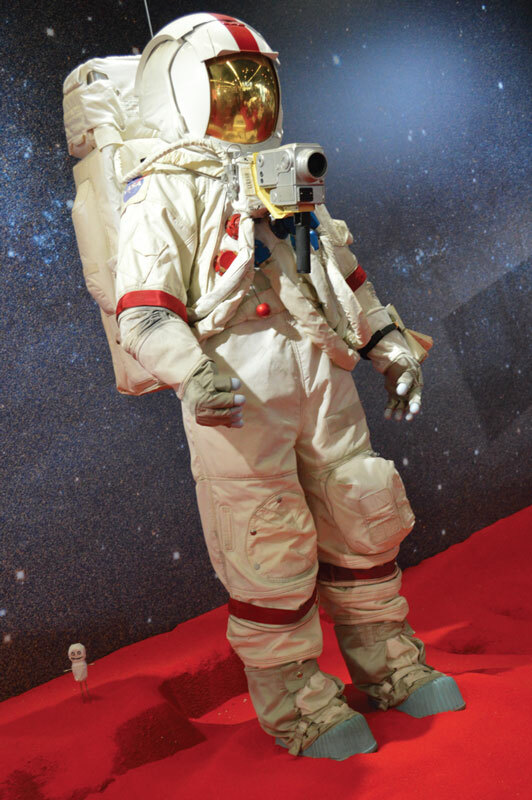 Many Techtextil exhibitors also embraced the Living In Space theme. 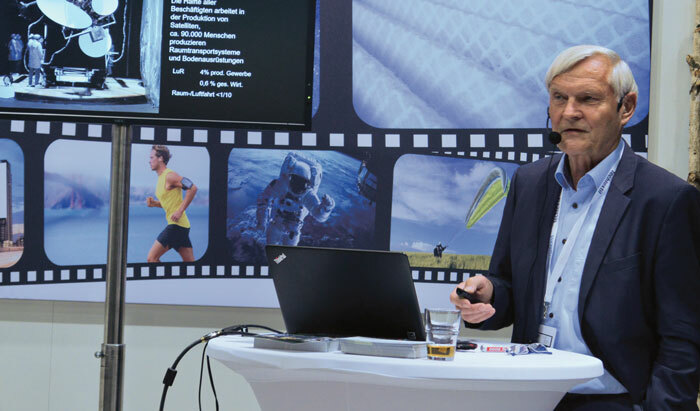 In particular, Germany-based Brückner Trockentechnik GmbH & Co. KG invited guests to the company’s booth to hear a presentation about technical textiles in aerospace given by Professor Dr. Ernst Messerschmid, a former German astronaut with ESA. The next collocated Techtextil and Texprocess in Frankfurt will be held May 14-17, 2019, at the Messe Frankfurt fairgrounds. The next Techtextil North America will be collocated with Texprocess at the Georgia World Congress Center in Atlanta, May 22-24, 2018.